Free Download BlueScale2013 Magento Template. Live Demo. Our informative top menu for Magento. Displays all subcategories at once. Quick Contact allow customers send the feedback to your site in easiest and fastest way.We have applied BlueScale2103 style for this Magento extension. This small extension will help to add informational tabs on product page. 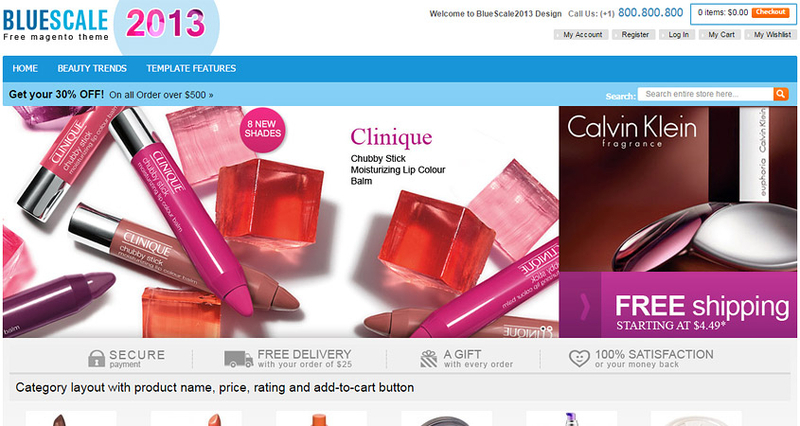 We have applied BlueScale2103 style for this Magento extension. The Blog extension provides your regular customers with up-to-date information. Magento extension allows you to quickly view product details on the same page. We have applied BlueScale2103 style for EM Quickshop. Site width from 990px to 1200px. Magento hosting solution. Stable, fast and secure. Fine-tuned e-commerce hosting environment! We keep our stores & demos with Magenting.com. Free Magento website transfer. You can free install our themes automatic with Magenting.com. best theme I've ever used!